Question: Why is shooting in bulb mode is the best way to get flicker free time-lapse? Answer: Because bulb exposure times can be set with a precision of 0.001 seconds. The precise, tiny increments allow smooth ramping of exposure when light is changing, i.e. at sunset or sunrise. When you run GBTimelapse through a laptop connected to a camera, GBTimelapse uses a software timer to control the camera's bulb exposure times. Although the software timer can be set as short as 0.100 seconds, it is most accurate and repeatable at times of 0.500 seconds and longer. The accuracy at a shorter duration is limited because of Microsoft Windows, which is not a "real time" operating system. Now, GBTimelapse (Version 3.7) can use the MX2 Dolly Engine from Dynamic Perception to control bulb exposure times. Because the MX2 runs in "real time" it has a much more accurate timer not limited by Microsoft Windows. This allow you to use much shorter bulb times and still avoid flicker. 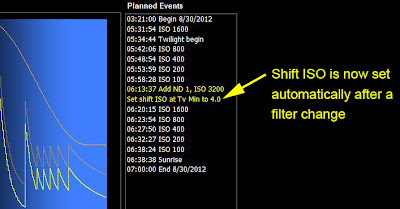 On a 5D Mk II, being able to reduce shorten the bulb time from 1.000 down to 0.033 seconds adds 5 stops to the Tv range. This means you can do a daylight/milky-way time-lapse using only one 4-stop neutral density filter rather than one 9-stop (or three 3-stop) ND filters. And, you can do a daylight/city-night time-lapse with no filters at all. To use the MX2, connect both the camera and MX2 to your laptop with USB cables. Then connect the MX2 "camera" port to the camera with a shutter cable and the "ext 1" port to the camera flash port with a PC/flash sync cable. For bulb control you can run the MX2 with power from the USB cable. To do bulb control and motion control, you will need to power the MX2 with a separate battery. New Feature in GBTimelapse Version 3.6.1! When using a large ND filter, AutoRamp will now automatically adjust the ISO shift time when the filter is added (or removed). All you have to do is add (or remove) the filter, and AutoRamp will take care of the rest. Most of the time I use GBTimelapse AutoRamp to capture a landscape time-lapse at sunset. But occasionally I get up early enough in the morning to do a sunrise. A couple of weeks ago I was awakened at 3 AM by the sound of thunder. Lightning storms are rare in this part of California, but it sounded like a good storm was headed my way. The previous evening I'd been running some tests with my Canon 7D, so it was already set up in an upstairs window. I quickly fired up my computer with the hopes of capturing some lightning in a sunrise time-lapse. Here's a demo showing how to set up a sunrise AutoRamp time-lapse, and the resulting video. I did manage to get a couple of good lightning bolts. The strike you see in this frame knocked out power for a couple of minutes. GBTimelapse was running on a laptop so it was unaffected. However, the camera was running on AC power, so I did miss a couple of frames. In a previous post, I showed you How To Calibrate a 9-Stop ND Filter. Here's a tutorial showing you how to setup GBTimelapse AutoRamp to do a Sunset time-lapse using a single 9-stop neutral density filter. ... and here's the resulting video, captured using a 5D Mark III with 16-35 mm lens. The Milky Way was brilliant that night. 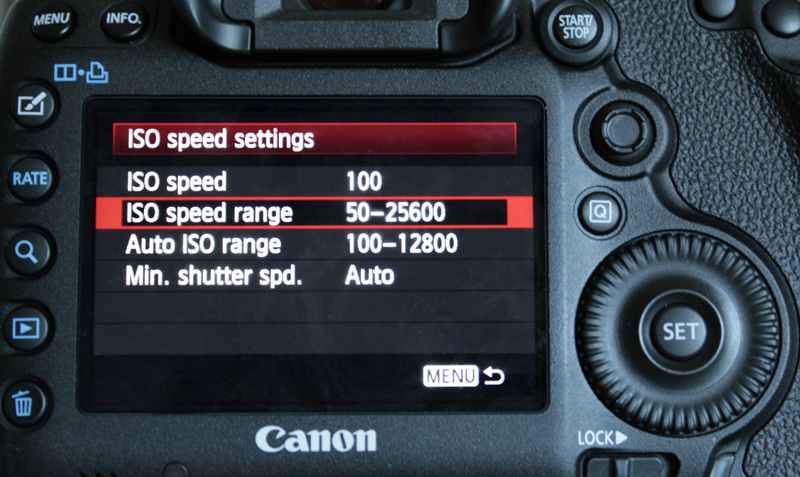 A major advantage of the 5D Mark III is the ISO 50 setting. It allows you to use a one second bulb time at f/2.8 with a 9-stop filter during daylight. However there are two minor disadvantages to the Mark III. First, the Depth-of-field Preview button has been moved to the other side of the lens from the Lens Release button making it awkward to do the lens-twist procedure. Second, unlike the Mark II it's not possible for GBTimelapse to change the AEMode - you must do it manually on the camera Mode Dial. Lately I've been using a single 9-stop filter to capture time-lapse during sunsets. By using a single 9-stop, I only need to make one filter change while the sun is setting. Previously, I used a stack of three 3-stop filters. But the filter stack added to vignetting, and using just one is much simpler. When using GBTimelapse AutoRamp in bulb mode with neutral density filters, it's best to know the exact value of each filter. Even though a filter may be rated at 9 stops, it may not be exactly 9 stops. I have found filters that are more than ten percent different from their rating. He also shows off some cool gear from Goal Zero for providing power in the field. This kit should be all you need for an extended time-lapse trek into the wilderness away from power sources. Thanks to Mike for the great work! Last fall during a visit to San Francisco, I stayed at a hotel in Emeryville across the bay. I always ask for a room with a view and was lucky to get one on the eleventh floor facing the SF bay. This was a great vantage point for a time-lapse. I used my 5DMkII with 16-35mm lens on a Manfrotto tripod and ball head, with the camera tethered to my Lenovo laptop. Since I was in a hotel room I had AC power for both the camera and computer. I was able to get both the sunset and the sunrise. The window wasn't very clean, but with the camera focused on infinity it looked right through the window grime. Below is the result, with some of the night footage removed to make it shorter. After achieving a good focus, I set the lens to manual focus and attached three ND8 filters. At 3 f-stops each that gave me a total of eight stops light reduction. But the sky was so bright, 8 f-stops was not enough to set the aperture at f/2.8; so I had to start the time-lapse at f/5.6 and rely on AutoRamp to reduce the Av down to f/2.8 as the sky darkened. Watch the video below to see how I setup the AutoRamp parameters. It shows the process of removing ND filters at sunset and adding ND filters at sunrise. There is some bright flashing in the video as the sun peeks out from the clouds. A couple of times that bright sun caught the dirt on the window and gave a bright flare over the screen. The night sky wasn't very dark because of all the bright lights. The yellow color of the city lights bothered me too. Since making this video I've added the ability to ramp the white balance color temperature with the sunset and sunrise. It's very easy to setup and I'll show this new feature in a blog post some time soon. Facing into a bright sun like this is very difficult. With three ND.8 filters I started at f/5.6 and bulb Tv of 0.275". It would have been better to start at f/11 and a bulb Tv closer to 1 second. Longer bulb times are more accurate. When you use a short bulb time (near a camera's minimum) the bulb timing error produces some flicker. I could also have done better by using stronger ND filters. If I had used there ND1.2 filters for a total of 12 f-stops, I could have used longer bulb times. Several time-lapse experts have asked: how can we use GBTimelapse AutoRamp with the Dynamic Perception MX2 dolly in two-axis mode - a combination of linear moco with pan/tilt? Previously, this wasn't possible because, the GBTimelapse/MX2 USB connection precluded the use of a pan/tilt head like the Merlin. 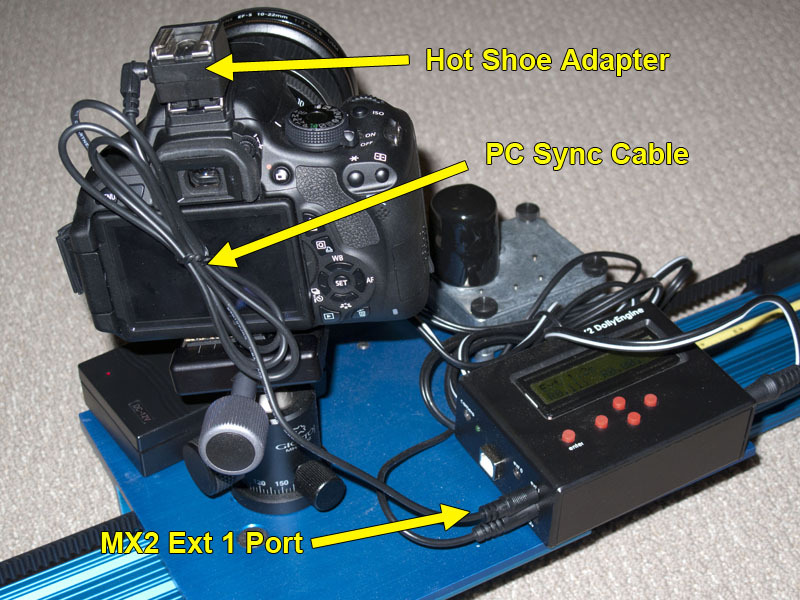 Now there's a simple method: just connect your camera to the MX2 dolly engine using a special PC sync cable. With MX2 firmware version 0.92 installed (thanks to Jay Burlage), the dolly will move one step whenever the camera shutter closes. A PC cable connects the camera to the MX2 Dolly Ext 1 connector by means of hot shoe and PC sync cable. 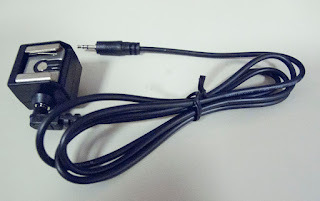 It’s not a standard PC cable - it has a PC sync connector on one end and a TRS connector on the other. TRS (tip, ring, sleeve) is also known as a “mini-stereo” or headphone connector. This cable is available from Promote Control for about $30. You don’t need their HDR controller. All you need is this cable. Within GBTimelpase no configuration is needed. 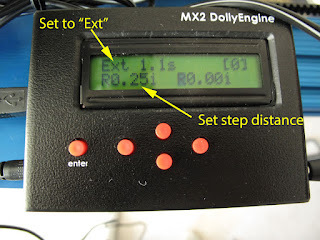 The dolly will move one step after each exposure is completed. 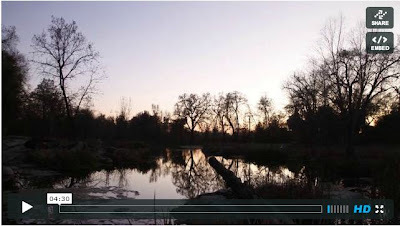 Below is a very cool video by Mike Lanfor using GBTimelapse, a 5D Mk III, the MX2 and a Merlin pan/tilt head. As he says, he had to abort the test when the lightning got too close for comfort! Thank you, Mike! Many people have been asking when GBTimelapse will be compatible with Canon's newest - the 5D Mark III. And the answer is: the Beta version is ready! Just go to this download link. The newly compatible GBT will install over your current version, and there's no need to re-register your license. If you don't already own GBT, you can install as a new free-trial. I quickly incorporated Mark III compatibility into GBTimelapse as soon Canon released their new software development kit. I've done some bench testing and captured a simple sunset Holy-Grail time-lapse, but I haven't yet done extensive tests. I plan to do more field testing this week. Because of your requests, I've decided to release this new version GBTimelapse 3.4.1 with Beta support for the Mark III. I don't expect problems, but will be anxious to learn how it works for you. The Mark III now has ISO 50! This is a great addition because it makes bulb shooting that much easier - a lower ISO allows longer bulb times. Make sure to configure your Mark III for this new ISO. And, while you're at it, make sure to turn off "noise reduction". Noise reduction can add many seconds of camera processing time when shooting RAW images at high ISO. This can painfully increase the time-lapse interval when doing sunset or sunrise time-lapse shoots. GBTimelapse' design makes it is relatively simple to add a new camera model. However, the Mark III was a bit more challenging, because there was a major change to the EOS Software Development Kit (EDSDK) design. 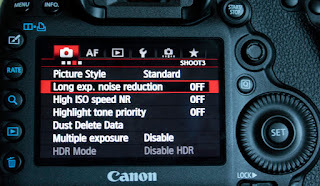 The new version removed the ability to change AEMode remotely on cameras with a mode dial (like the 7D and 5D). The AEMode dial is the one with settings for P, Tv, Av, M, and Bulb. Earlier EDSDK versions allow AEMode to be changed remotely.That's a neat ability because it makes it possible for the GBTimelapse AutoRamp feature to automatically switch between Manual and Bulb mode. This is necessary sometimes when shooting very long time-lapse unattended, when it's not practical to stay in Bulb mode and manually add or remove ND filters. I've added a new camera group (Group 3) just for the Mark III and I've kept the 7D and 5D Mark II in Group 2. Group 2 cameras retain the ability to change the AEMode remotely (except for the XTi, T3, T3i and 60D) . People often ask me "What hardware do I need to run GBTimelapse?" Well, that depends on your situation. GBTimelapse is a powerful tool that's being used by all kinds of folks. Pros are using the software for feature films and network TV, sometimes with incredible lenses that cost the same amount as a house, and sometimes with a very basic setup. The great news is that you can get amazing time-lapse results with a simple, portable and inexpensive setup. If you want to capture quality time-lapse on a budget, please read on. I'll show you the specs of my minimum system. It's low cost, low weight, and low complexity - but can still deliver near "holy grail" time-lapse results. ASUS claims a 12 hour battery life for the model 1025 netbook. So far, I have only run it for four hours in the field but still had plenty of battery life left. It's not a very fast machine, so it takes longer to download and process RAW images. It can capture full-sized RAW images in about a 12 second interval. I can get the interval down to 6 seconds by setting GBTimelapse to only display RAW thumbnails during a time-lapse. I recommend a wide angle zoom like the Canon 10-22mm lens and a very dark neutral density filter like the Hoya 9-stop. With this combination, I can use a bulb time of one second in daylight at f/4.5 and ISO 100. After sunset when the bulb time has increased to 16-seconds and the ISO to 3200, I can remove the filter and continue on in bulb-mode to capture the night sky. The video below walks you through the system. You can get good results with this minimal hardware, of course, if you use a more powerful laptop, camera or lenses, the results will be even better. Check out the demo..
GBDeflicker Application New Features: Instant Gratification! You know it's always best to shoot in RAW when doing a time-lapse, because of the higher quality images. But if you're like me, you're anxious to see the results as soon as possible. It takes a lot of time to process a RAW image sequence and then fire up After Effects (or other editor) to make a video. Now you can get instant gratification with RAW, through two great new features in GBDeflicker 2 (Windows Application). GBDeflicker can now import sequences of Canon RAW files (.cr2 or .crw) in addition to .jpeg, .gif, .png, .bmp and .tif files. It will deflicker the images and output a sequence of .jpg, .bmp, .png or .tif files. Take the deflickered output and run it through the video program of your choice (After Effects, Premiere, etc.). GBDeflicker can make an output video (.mp4 format) of your image sequence. This is a great way to get a quick look at your work without the need to run After Effects or some other video program. Normally processing a RAW image sequence is a time-consuming task, but now you can drop your RAW image folder onto GBDeflicker and make a quick-look video in just a few minutes. You just set the preview image width (320, 640, 720, 1280 or 1920) and leave the rest to GBDeflicker. The preview video feature is free, you don't need to buy a license! 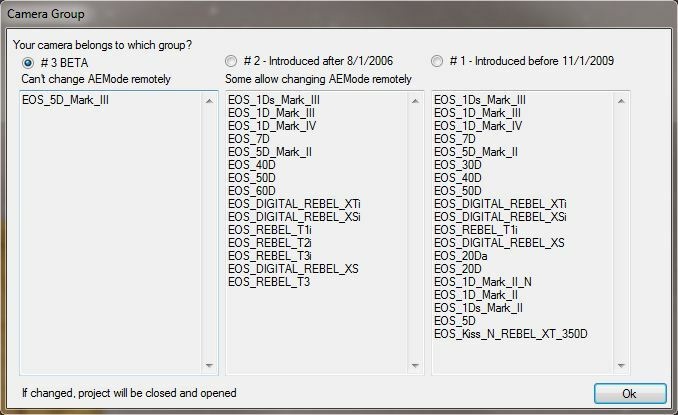 Canon firmware has been caught misbehaving! 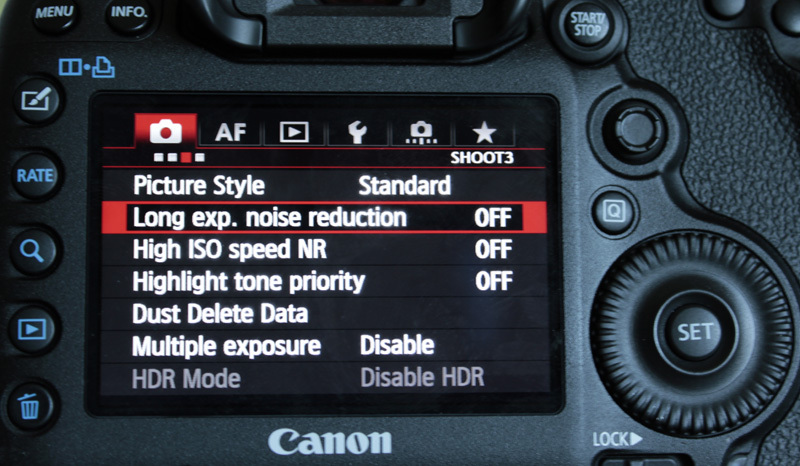 The Canon 5DMk II firmware has a significant bug related to bulb exposures. A fix is included with GBTimelapse version 3.3.24. If you are using a Mk II, please download and install the latest version of GBTimelapse. GBTimelapse has stalled several times when controlling a 5D Mk II with a very short time-interval. I traced the problem down to a bug in the Mk II firmware (or maybe in the Canon driver - it's not possible to tell). Even though this bug is due to the MK II firmware, I've found a way to clear the error and continue. The BUG: a random and intermittent failure to start a bulb exposure. It can happen if GBTimelapse starts a bulb exposure immediately (no delay) after having downloaded the image from a previous bulb exposure. Sometimes when GBT sends a bulb-start command to the camera, the camera returns a value indicating success - but fails to open the shutter! This leaves GBT waiting for an image download that never happens. My TEST: to reproduce the bug, set a 5D Mk II to RAW images, bulb-time = 2 seconds, and time-lapse interval = 4 seconds. With these settings it takes nearly 5 seconds to do the bulb exposure and download the image. 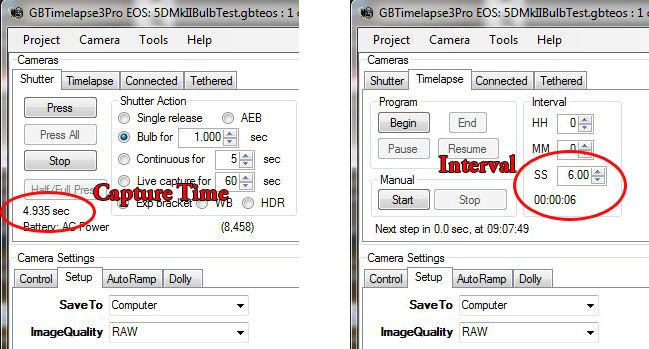 Because the interval is only 4 seconds, GBT tries to capture the next image immediately after the download. 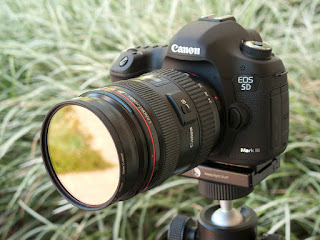 The 5D Mk II will fail to capture an image about once every forty images under these conditions. The FIX: the new GBT version detects the error, clears the Mk II, and continues with the time-lapse. However, the interval for that one image will be a few seconds longer than normal. You will see a message on the main screen when this happens "Bulb Start error 'EDS_ERR_DEVICE_BUSY'", but the time-lapse will continue. TIP: although the error is fixed, it's best to avoid the situation - I suggest not pushing it. Make sure your time-lapse interval is longer than the total capture time (bulb time + image download time). Just take a test exposure to see what the total capture time is. Using a script is GBTimelapse advanced technique for time-lapse perfectionists. Following a script can produce the best result, if you are repeating a time-lapse that you have shot before. Normally GBTimelapse' AutoRamp adjusts the exposure by measuring the luminance of images as they are captured and changing the camera settings to achieve the target luminance. Because it is continuously measuring and adjusting there may be tiny fluctuations in image luminance. But when following a script, it adjusts the exposure to match the measured scene exposure from a previous time-lapse session. Because the camera settings are defined in advance, there are no small fluctuations in luminance. GBTimelapse: AutoRamp Script Demo from Granite Bay Software on Vimeo. GBTimelapse: Now with AutoRamp HDR! Now GBTimelapse can capture High Dynamic Range time-lapse images in addition to its other powerful features. Using its AutoRamp feature, GBTimelapse captures a set of three images at each step (at a normal exposure, at two stops under exposed and at two stops over exposed. You can capture RAW or JPG and save to your computer or to your camera (for faster operation). And it can do this while controlling a motion control dolly! Please watch this demo video and take a look at the sample HDR time-lapse. It produced an amazing "Holy Grail" result even with a Canon T3i capturing JPGs. 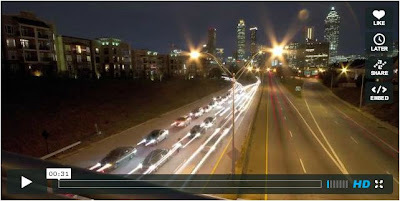 GBTimelapse: AutoRamp HDR Demo from Granite Bay Software on Vimeo. I just created a new forum for GBDeflicker and GBTimelapse. It's intended to be a user-to-user forum where you can share information and tips. If you have a specific support question, you can submit a support ticket here. It's much better and easier to use than the previous version. Since it's just getting started there's not much content yet. So please go there and ask questions - I'll be listening and trying to answer quickly. In the last blog post, we announced that Albert Dirschler has created German translations for the GBDeflicker and GBTimelapse User’s Guides, which are now available for download here. Thank you again to Albert! We thought it would be fun to continue the theme, and introduce a featured GBTimelapse user from Germany. Kukulies & Associates Ltd is a production company in Düsseldorf. They’re time-lapse specialists, and just sent us a link to a showreel of work they’ve created with GBTimelapse. Kukulies & Associates Ltd. creates innovative time-lapse movies, and has over 15 years experience in production and editorial projects for TV stations and companies. They’ve been using GBTimelapse to document massive setups for special events such as stadium concerts and trade shows. 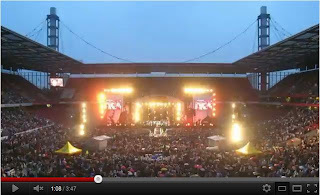 This showreel is a great example of how the GBTimelapse can be used for remote site-monitoring. Just set the camera up, and via a laptop and internet connection, you can maintain full control over your time-lapse from where ever you happen to be (while the camera is in the field, you can control it from your desk, bed, bar.. etc). We use only the most modern high-resolution digital systems. The exposure is adjusted in real-time response to changing light conditions of the subject. The advantage: no need for the costly expense of photographers in the field. Our on-site systems require only a standard power supply. We maintain complete control of the recordings via wireless or LAN in our agency! Our staff centrally monitor the image data, and maintain optimal settings. Through this setup, we can guarantee the best starting material. This reduces the cost to a minimum. Especially when one of the movies is distributed on the Internet, or used in presentations, the brightness, contrast and color intensity of the source data are crucial to ensure that we get the best results after conversion and compression. Due to the perfect starting material we get from our remote capture system, movies in HD (BlueRay and HD-DVD) and the standard 35 mm film appear in an impressive brilliance. Bedienungsanleitung jetzt auch auf Deutsch erhältlich! Albert Dirscherl war schwer damit beschäftigt, unsere Dokumentation zu übersetzen. Albert hat uns mitgeteilt, dass er eine deutsche Version vom "GBTimelapse User's Guide", vom "GBDeflickerApp User's Guide" und vom "Holy Grail White Paper" erstellt hat. Die drei Dokumente sind ab jetzt auf der "Granite Bay Software"-Webseite erhältlich (siehe Link in der linken Spalte dieser Seite). User’s Guides now available in German! User’s guide", and the "Holy Grail White Paper". All three documents are now available on the Granite Bay Software web site: see the links in the left panel on this page. The servers at SWREG, our online store, were down from Thursday afternoon (Feb 23, 2012) until Saturday night. There are a few new features in the latest GBTimelapse release. If you already own GBTimelapse, just download and install this new version. No upgrade is needed. 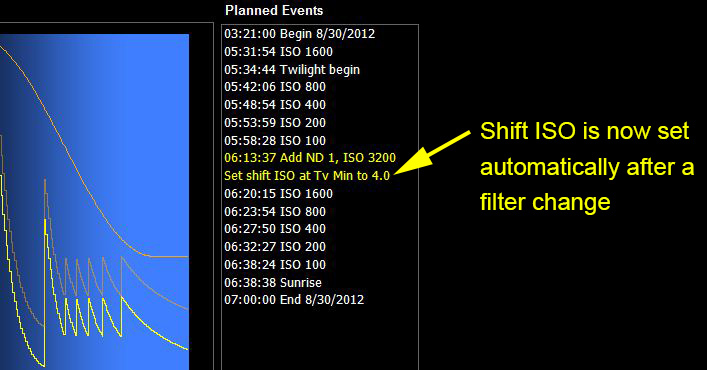 1) Added ISO calibration tables for the 5D Mk II and the 7D. This feature is enabled by a checkbox in Tools/Options. Using the ISO calibration table can improve AutoRamp reciprocity accuracy and minimize luminance shifts when changing ISO. 2) Added a default f-stop setting to the Camera/Profile. If you use the lens twist method to eliminate aperture flicker, be sure to set this value. It will be used if you didn't take a shot before doing the lens twist and GBTimelapse can't read the Av value from the camera. 3) The AutoRamp maximum ND filter value has been increased from 9.9 to 12.0 to allow the use of 10-stop filters. 4) The 1D Mk IV default camera settings were changed to allow bulb mode shooting. If you downloaded the GBDeflicker 1 Plugin for CS4 recently, you may have been unable to activate the free trial. If that happened to you, please download the newest release (version 1.5.14). After you install this new release, you should be able to run GBDRegister and activate the free trial. The older version (1.5.13) had a trial license that expired on January 29th, 2012. Dang! I hate it when that happens.